Alrighty, I’ve already shown you some photos from Cheekwood Gardens as well as photos of my totally-necessary-and-wonderful-sourvenir yarn and the Nashville Zoo. Here are just a few remnants from last week’s vacation (two weeks ago already?) to round out your vicarious adventures. There were some neat sculptures along a wooded path in Cheekwood Gardens. 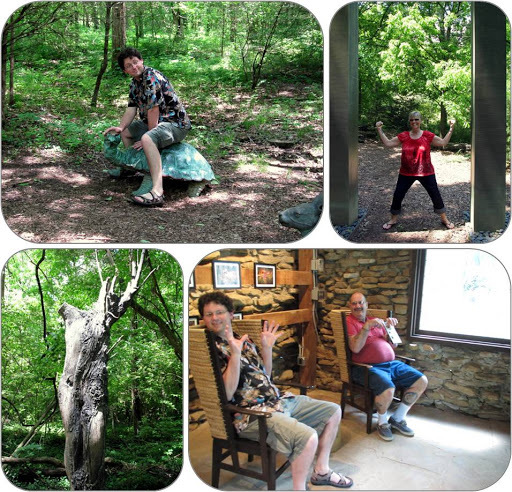 Here you see my Fiasco befriending a tortoise sculpture, my mom demonstrating the power of another sculpture, my favorite sculpture showing a body/tree trunk, and my Fiasco and Dad trapped with T-rex arms in chairs too small for their shoulders (just because it’s adorable). By the end of a week in Nashville I was more than a little sick of country music but here are photos of the outside of the Grand Ol’ Opry, a stylin’ dress from within the Country Music Hall of Fame, and Elvis’s totally reasonable gold-plated, diamond-dusted vehicle. I lived in Florida for a year in between my undergrad and grad school days, during which time I made a very dear friend Candice, shown here with her fiance, Greg. I had only been able to see her once in the past 5 years so it was awesome to get to see her again, however briefly! 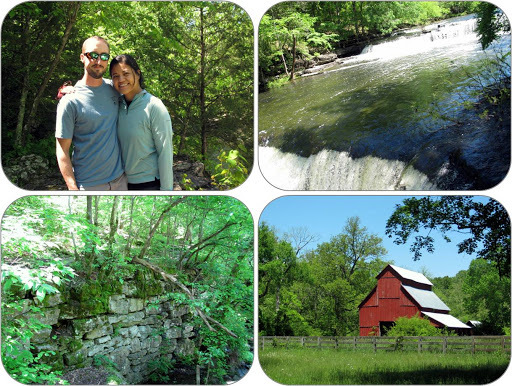 We headed to the woods for a hike where we saw rivers, old Native American forts, and idyllic farmhouses. 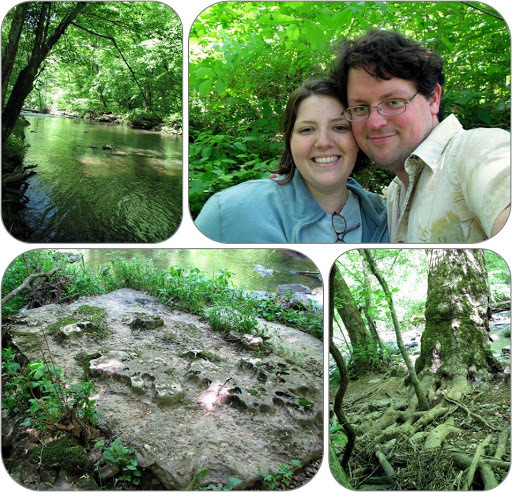 The Fiasco and I took advantage of our time alone on the trip to see more streams, happy smiles, neat water-carved rocks, and big ol’ trees with gnarly roots. 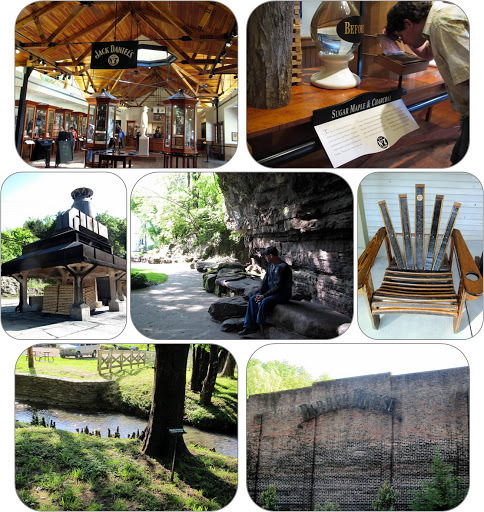 Finally, for no reason whatsoever other than it seemed A Thing To Do In Tennessee, we visited the Jack Daniel’s whiskey distillery. The Fiasco dislikes whiskey and I only vaguely remember drinking some that was passed around at a party once so it’s not like we were big fans but now I’m curious. We couldn’t taste any at the distillery because it’s located in a dry county (ironically hilarious!) but the tour was still pretty interesting and it was free so I’d recommend it if you have an hour. I couldn’t take photos of inside the main parts but shown above is the visitor center, the Fiasco sniffin’ some filtered whiskey, the place where they burn sugar maple wood to make their filtering charcoal, our tour guide Dusty sitting in front of the water that is used to make the corn mash whiskey is distilled from, a cool chair made of old whiskey barrels, a bald cypress tree because I LOVE cypress trees and I miss them (they don’t grow in the north but I did my undergrad thesis on them and think they’re awesome, and yes I go to a distillery and take photos of the trees), and finally, a photo of the barrel house which was pretty impressive inside. Did you know that whiskey has to age 4-6 years before it’s ready? Now you do! Phew! That got a little rambly towards the end there, didn’t it? Hope you enjoyed it anyway and are having a fabulous holiday weekend! This entry was posted in life, Science&Nature by shoelaceswitcher. Bookmark the permalink. Thanks for all the photos. I loved seeing them. It looks like you had a great trip! Whew, quite the whirlwind trip! You guys did so much! You got some fantastic photos too, I particularly love the photo of you and Fiasco, you too are such an adorable couple! It is great that you were able to keep up with an old friend, you have reminded me there are a few people from college that I should probably say hi to. Thanks for sharing your fun adventures! T-rex arms! That is my favorite image. How funny that the distillery would be located in a dry county. Aw, you always leave such sweet comments. Thank you so much! It can be hard work keeping in touch with old friends but it is always worth it.